RE: Bear Flag, Story of the Creation of, and did Mrs. Ide provide the red stripe? After many hours wondering around cyber space… I found several accounts of the creation of the Bear Flag… or perhaps that should be “Bear Flags…” The SNOPS web site even has a story that the original design was to have been a PEAR — not a bear, for Mr. Bartlet (i.e. as in pear, and a member of the group). .
— Another man left at Sonoma was William L. Todd who painted, on a piece of brown cotton, a yard and a half or so in length, with old red or brown paint that he happened to find, what he intended to be a representation of a grizzly bear. — Williams also gives to Fremont the credit for advising the Bear Flag men to lower the Mexican flag, if successful in taking Sonoma, and to raise “some sort of flag of our own.” To date, Williams’ report is the only one seen which gives to John Charles Fremont the credit for originating the idea for a flag, albeit saving credit for the actual design and creation to members of the Revolt itself. With Fremont’s Gavilan Peak raising of his, U.S. style flag only 3 months past, a suggestion by him to thumb the nose at the Mexican Californios with another flag certainly is psychologically appealing. Babe Williams interestingly claims that he and two others “went to an Italian store and purchased two or three yards of common, unbleached domestic.” An Italian store? By this, unless there was some colloquial meaning for this phrase, one must assume that Williams meant a store operated by an Italian emigrant then living at or near Sonoma. Here is one fact from Williams which should be able to be investigated. Was there an Italian emigrant operating some sort of shop in the vicinity of Sonoma, which would, or could possibly, have had such material? The existence of such a shop would add credibility to Williams. The absence of such a location would cause one to wonder what trick of memory could have caused Williams to make such a mistake of specific fact. Williams notes that the work on the flag occurred “on an old work bench”, not the ground as at least one report has suggested. He also confirms, as do most sources, the role of William Todd in drawing the original flag. He contends the star was drawn “with a piece of red chalk”. Other sources have described “lamp-black and poke-berries,” “outlined in ink, and filled in with red paint,” “Linseed oil and Venetian red,” “with ink drew the outline of the bear and star,” “a pot of berry juice”. The author is unaware of any other report of the claimed use of “red chalk.” The bear on the Bear Flag has been described primarily as being in one of two different positions: (a) either on all fours as is the bear of the State Flag (passant), or (b) standing on two legs in an attack position (rampant). Williams reports that the bear was standing, placing him with the minority. Williams’ view is contrary to Todd’s descriptions and his accreditation of the passant bear – flag which for 48 years was held by the Society of California Pioneers. This flag was destroyed in the 1906 San Francisco Earthquake, but photographs of it still exist. The Todd flag has been traced convincingly from Sonoma on July 9, 1846, until it was donated to the Society in 1855. The Todd passant-bear flag carries a reasonable probability of being the flag lowered at Sonoma at the time the U.S. flag was raised there in July 1846. Todd’s description of a spelling error still visible on the original flag also lends credibility to the flag at the California Pioneers. On the other hand, Todd’s accrediting testimonials were not made until the early 1870s, a quarter-century after the events. Those statements of Todd do not answer the question of how many flags Todd participated in making. cf. Williams (“a dozen Bear flags made and floated”) Was the flag lowered on July 9, 1846, the same flag as first raised on or about June 14th? We simply do not know. — Of all of the statements about the Bear Flag from George W. Williams, the one of greatest significance to overall Bear Flag history is the following: “I have no doubt that within the next ten days [from June 14, 1846] there were a dozen Bear Flags made and floated. Every one who had a boat, store, or public place, desired them, and many of them made Bear Flags.” This one statement may serve as a basis of explaining the many conflicting reports about the flag of the Bear Flag Revolt, although adding little to determining which was the first. Any Bear flag made in a show of support of the Sonoma Revolt and dating prior to July 9, 1846, carries with it substantial significance. However, until such time, if ever, that contrary, convincing evidence is located, a flag design drawn by William Todd bearing a single star, with some sort of bear as suggested by Henry Ford, and a red stripe along its bottom must receive tentative credit as the original design. — SONOMA, June 13th 1896– Brave men and fair women joined to-day in a mighty cheer as the original Bear Flag was run up to the peak of the same flagpole that bore it just fifty years ago…. As the speaker closed, two of these survivors of the Bear Flag party, B.F. Dewell and Henry Beeson — the others, Harvey Porterfield, of Napa county, and Thomas Knight, of San Francisco, were absent — attached the tattered old flag to the suspended halyards and slowly hoisted the synbol to the top of the staff. The act was greeted by continued cheering. (PP.7, 8) Mr. Dewell answered a few days ago the questions propounded by Bancroft, to-wit: “Who furnished the cotton? Who the flannel? Whence came the red paint? Was the cloth new or old? Had the flannel graced the undergarment of a fair and patriotic lady, or had it filled a humble station as a part of a man’s red shirt?” Mr. Dewell’s answers describe the flag graphically. “The pioneer does not remember who furnished the cotton, but cotton was plentiful. Red flannel was very scarce, however. Mrs. J. Grigsby and Mrs. W. B. Elliott furnished the red flannel. The latter supplied all she could from a petticoat, and then from the leathern-shirted throng a committee of one was chosen to call upon Mrs. Grigsby for the remainder.” It happened that the lady was in the act of cutting up red flannel for an expected baby Grigsby. She yielded, however, to the exigency of the hour and denied herself and her unborn babe that the flag might be completed. “The flag was made,” said Dewell a few days ago, “in the front room of the barracks, just at the left of the doo, and most of the sewing was done by myself. ‘Bill’ Todd painted the bear and star with black ink. The colors –red, white and blue– were used because they were the colors of the United States flag. The bear was selected as representing the strongest animal found in that section of the country. The language of the flag was: ‘A bear stands his ground always, and as long as the stars shine we stand for the cause. '” Mrs. Dewell, who was a daughter of the petticoat-sacrificing Mrs. Elliot, remembers the flag well. She says it consisted of nine or ten stripes alternating in white, red and blue, with a blue square in the upper corner next the staff, a black star on the first white stripe, and a black bear on the second white stripe. 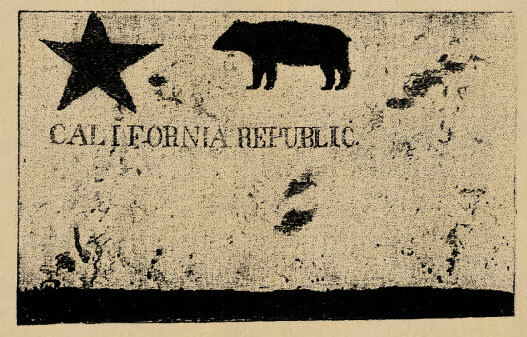 Underneath the bear were the words, “California Republic.” The bear and lettering were in ink. Thomas Cowie helped Dewell in the sewing, as they were both saddlers by trade. Wm. L. Todd, in a letter to the editor of the Los Angeles Express, under date of January 11, 1878, gives the following version of the construction of the bear flag: Your letter of the 9th inst. came duly to hand, and in answer I have to say in regard to the making of the original bear flag of California at Sonoma, in 1849, that when the Americans. who had taken up arms against the Spanish regime, had determined what kind of a flag should be adopted, the following persons performed the work: Granville P. Swift, Peter Storm, Henry L. Ford and myself; we procured in the house where we made our headquarters, a piece of new unbleached cotton domestic, not quite a yard wide, with stripes of red flannel about four inches wide, furnished by Mrs. John Sears, on the lower side of the canvas. On the upper left-hand corner was a star, and in the center was the image made to represent a grizzly bear passant, so common in this country at the time. The bear and star were painted with paint made of linseed oil and Venetian red or ‘Spanish’ brown. Underneath the bear were the words “California Republic.” The other person engaged with me got the materials together, while I acted as artist. The forms the bear and star and the letters were first lined out with pen and ink by myself, and the two forms were filled in with the red paint, but the letters with ink. The flag mentioned by Mr. Hittell with the bear rampant, was made, as I always understood, at Santa Barbara, and was painted black. Allow me to say, that at that time there was not a wheelwright shop in California. The flag I painted I saw in the rooms of the California Pioneers in San Francisco, in 1870, and the secretary will show it to any person who will call on him at any time. If it is the one that I painted, it will be known by a mistake in tinting out the words “California Republic.” The letters were first lined out with a pen, and I left out the letter I, and lined out the letter C in its place. But afterward I lined out the letter I over the C so that the last syllable of “Republic” looks as if the two last letters were blended. Yours respectfully, Wm. L. TODD.